Its been a silly long time since writing anything on here. I have decided to shut this site down and try and put together something proper. Christine made it with real heart and passion and it made me realise that that is what I need to do. Not faff around with my ideas about Phil’s songs but make something that he deserves. Something that might last. So, thanks to everyone who read this site. I hope it wasnt too bad. I promise the next thing will be better. Between his 5th LP (Don’t Try This At Home) released in late 1991 and his 6th (William Bloke) released in 1996, Billy Bragg changed. Certainly over a five-year period it would be stranger were he not to have changed, but these changes were not minor. After years of touring a bout of appendicitis forced him to take a break and convalesce. He then got married and had a kid. How would the lovelorn troubadour react to being a husband and father? How could he balance domesticity with activism? William Bloke gave all the answers. Opener From Red To Blue dealt with the politics straight away. At once reaffirming his own commitment whilst castigating those who allowed changes in their personal life to affect their politics, it was strident classic Bragg, with a family twist. To Bragg of 1996 the question wasn’t whether he would allow family life to make his politics become more selfish (and more Blue) but whether he should “vote Red for my class, or Green for our children”. It’s a wonderful song, but perhaps not a genuine departure from his other works. I can’t help but make comparisons between Billy Bragg and Phil Ochs. Each is (or was) the foremost political songwriter of their time. Both wore their politics proudly, wrapping it up in melody, anger and humour. Both brought their audience onside with sometimes madcap, often self-deprecating, always engaging stage banter. There is however one massive difference between them – love. For all his obvious political commitment, it is songs of love that absolutely defines Billy’s career. “I don’t want to change the world, I’m not looking for a new England, I’m just looking for another girl” may or not be a wholly truthful line, but it speaks of a truth none the less. 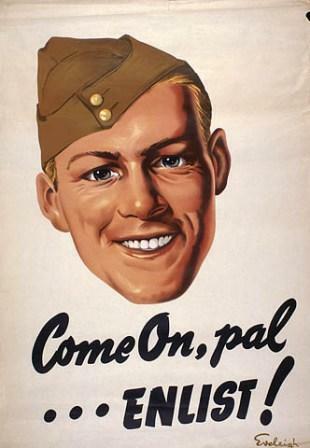 Songs such as The Home Front, Valentine’s Day Is Over and even Between The Wars, served to humanise political issues. In Upfield he sings of “Socialism of the heart” and this “heart” is everywhere, in the personal as well as the political. Most obviously in songs such as The Only One (“the chain that fell off my bike is wrapped around my heart”) but is key to…well, pretty much every song he ever wrote. He may not mention L.O.V.E much, but it lurks behind so many of his lyrics. Which brings us to Brickbat. It probably sounds proper wanky to say so but to me this is the key Billy Bragg song. This isn’t an apology for domesticity. This is a celebration. This was, in Billy’s own words, a song about getting a life. The life that so many of his other songs documented the search for. For life, read love. Read, family. He sings – “I used to want to plant bombs, at the Last Night of The Proms” (don’t we all! Metaphorically at least), taking us to now, to his new reality – “but now you’ll find me, with the baby, in the bathroom, with the big shell, listening for the sounds of the sea – the baby and me”. It’s a beautifully, simple scene. A brickbat is a something can be used as a weapon. In using it as the title of the song it’s a as if he’s taking something he could be attacked with a turning it against any accuser – “And through it all, the stick I take is worth it for the love we make”. The song ends with three words – “I love you”. Political commitment, however, is present, stark and obvious. Phil’s 3rd album, the sparse, overtly political Phil Ochs’ In Concert, ends with When I’m Gone, an affirmation of political action like no other. His next album is far less obviously political, and the sparseness (by 1967 not so much a byword for folkish authenticity as a tired cliché) replaced with a lushness of strings and an overload of poetical ideas. And yet as with Billy’s William Bloke, it opens with a reaffirmation of all that had gone before it – “I’m gonna give all that I’ve got to give”. Unlike Billy’s song it wasn’t reaffirming activism in the face of comfort and love, rather it was in the face of disappointment. Each verse is a litany of despondency and regret. He sings of dreams turning into nightmares, of warm feelings becoming deformed, of screaming and mistakes. All of which makes the refrain – “cross my heart and hope to live” – all the more life affirming. I want to live, not because of the joys of life, but despite all of its horrors. It paints Phil as a contrarian, happiest in opposition. Happiest when there is something to fight. And there is his Brickbat. Or at least his closest song to Brickbat. The bravest song he would ever write. Bach, Beethoven, Mozart and Me. Just like Billy’s song it sings of quiet, of domesticity, of the life that happens when you’re making other plans. But where Billy’s song is warm and cosy, with arguments feeling real and small and normal – here we find dullness, life-sapping dullness. The morning breaks with dust in the air. Phil lays on his back. Life goes on around him, humdrum, uninspiring. He is “surrounded by cemetery”. He sings of the “Warner Brother’s ghost”. Phil’s description of Los Angeles as a “sensual morgue” rings true here. The word that springs to mind is moribund. And yet I called this song brave, and it is. Partly because he portrays his life as dreadfully uncool. He singing of truth for its own sake, there is no pretence here. “Nobody gets along”. Eurgh. The various characters that we meet – Karen, Frances, Eric, Andy, Eric, Walter – appear just as names followed by characterless actions. Whilst we may be able to figure out who they are (if “speechless” Walter is Walter Cronkite for example, than that tells of a deeper sadness) it’s as if Phil doesn’t want us to know, maybe doesn’t want to know himself even. In Brickbat Billy sings, “the past is always knocking incessant, trying to breakthrough into the present”, followed by a warning that “we have to work to keep it out”. Here though, Phil “dreams of the past”, or rather escapes into it. And where can he go from here? Billy described the Brickbat as a song about finding a life, a life with activism, a music career and a family balanced, precarious maybe, but balanced all the same. Phil’s life away from music and politics seems…virtually non-existent. In his previous album he sang “my life is now a death to me” and here it is, presented as evidence. And it’s rather shocking. Horrible even. And where does he go from here? The final two tracks on his final studio album. Basket In The Pool – a rather vacuous song of a rather sad, pointless act of defiance. And finally, No More Songs – the end of the world. I’ve been rather dreading writing this. I’m not sure I’ll be able to fully explain why, but then again, maybe I don’t have to. When I think about Phil Ochs, my Phil Ochs, the one that I have invented by listening to him singing, Changes just doesn’t compute. And yet when I read about Phil, when I see what songs he sang live, when the votes are cast for Phil’s most popular songs, there it is, at the very heart of Phil’s sets throughout his career, at the heart of other people’s love for Phil. Obviously it’s me with the problem. Trying to explain why you like something, or dislike something, seems a little pointless. Especially when that something is as obviously pretty as this. It’s a nice song. But then I don’t listen to Phil because he wrote nice songs. With Phil I always expect a little more. And more often than not I get it. I’m not gonna bang on about it, but I will say this – I do find the relative popularity of Changes suspicious. Phil’s two most covered songs (at least during his lifetime) were almost certainly There But For Fortune and Changes. I don’t think it would be such all that controversial to suggest that these are also Phil’s most atypical songs. One interesting thing to note (to me at least) is the gender divide in those who covered them. There But For Fortune was covered by Joan Baez, Francoise Hardy, Marianne Faithful and, even Cher. Changes on the other hand is far more male, being covered by Gordon Lightfoot, Crispin St Peters, Gene Clark, George Hamilton IV and, most recently, Neil Young. Of course women covered Changes too, and men have sung There But For Fortune, but the gender imbalance remains. When Phil sang them the arrangements are almost identical – finger picked, restrained, gentle. In all instances mentioned above the covers of There But For Fortune remains the same, just about. That pleading caring unaltered. Changes on the other hand is nearly always played upbeat, jaunty even, inspired less by Phil’s version then by Gordon Lightfoot’s (at least I think his was the first to do this). Note – it is “your tears”, “I’ll kiss you” – it is plain who is doing the leaving here, who is in control. To consider this as a “masculine” trait seems rather odd now, dated perhaps. In 1965 however it would have been rather less so. Dylan’s mid-sixties oeuvre is packed with untender put-downs (“you just kinda wasted my precious time”) for example. Which isn’t to say that Changes is cold or heartless, it’s just a little bit…put it this way, I can’t imagine anybody who has been dumped feeling particularly reassured by being told “Like petals in the wind, we’re puppets to the silver strings of souls”. Rather than empathise with his heartbroken ex, the singer instead chooses to point out how small and pointless we all are, set against the vastness of space and time such things as heartbreak are little more than whimsy. 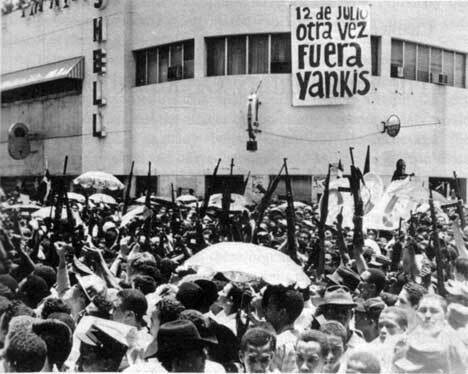 On April 24 1965, in the words of historian Ricardo Santiago, “the workers and farmers of the Dominican Republic poured into the streets, arms in hand, with the goal of creating a truly democratic, independent country”. The United States didn’t stand idly by. Invoking his “beloved” predecessor’s assertion that the United States must “use every resource at our command to prevent the establishment of another Cuba in this hemisphere”, President Lyndon Johnson moved swiftly to counter the revolution. According to Johnson (aided by McGeorge Bundy and Robert McNamara) the aim of the revolution was not true democracy but the “establishment of a communistic dictatorship” and despite initially having “no desire to interfere in the affairs of a sister republic”, he soon changed his mind. US Marines first landed in Santo Domingo in May 1916. Already in control of the Dominican customs authority, after 1916 it sought full control of its lucrative sugar cane industry and, eventually, its government. 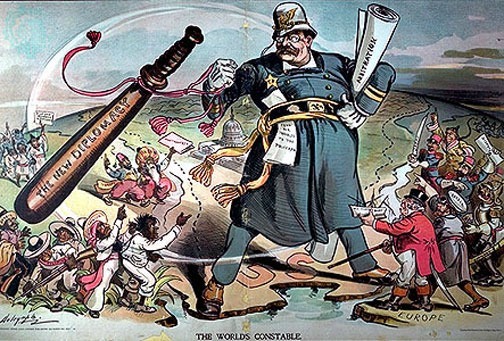 The US stayed in de facto control until 1924, but its influence remained. In May 1930 Rafael Leonidis Trujillo rose to power following a sham election. His brutal reign was only ended 31 year later by a CIA backed assassination following public pressure. The US tried to bring Trujillo’s protégé Joaquin Balaguer into power, but the popular uprising that brought a brutal end to Trujillo, stood firm. In February 1963 Juan Bosch, a liberal poet and longtime opponent of Trujillo, was elected President. He remained President for only seven months however, ousted by a US backed coup d’etat in September 1963. In those seven months Bosch sought to redistribute Trujillo’s vast wealth and began a nationalisation and land redistribution programme. Though an anti-Communist he angered businessmen by seeking to strengthen the labour movement. He angered the Catholic church by legalising divorce. With his country under the shadow of the United States and its interests in the region, his presidency was doomed from the start. In the words of Matias Bosch of The Juan Bosch Foundation in Santo Domingo “U.S. foreign policy supported the promotion of democracy in Latin America provided that the Latin Americans protected U.S. national security and economic concerns in the region”. Bosch’s Presidency was seen as a threat to these “economic concerns”. This became known as The April Revolution. What began as an internal (though obviously US influenced) struggle soon became, in Matias Bosch’s words “a patriotic war because of the U.S. military intervention”. Johnson’s statement, released a week or so after Caamano’s coup, sought to rather coyly paint the US as peacemaker. He spoke of rescuing those American and foreign nationals under threat, of sending planes and ships to evacuate those seeking to flee. However, soon these warships and planes would be bringing American soliders in their tens of thousands. Rather than end the struggle, US military intervention only served to prolong it. Six months of fighting and several thousand lives later the revolution was crushed. In those six months there were more American soldiers stationed in the Dominican Republic than in Vietnam. In yet another sham election (historians Bailey and Nasatir claim that some 300 Bosch supporters were killed by Balageur’s men in the run up to the election), Balageur returned to power in 1966 where he would remain for 22 years, ushering in a new reign of oppression that continued unabated under the watchful eye of the United States. In 1975 Juan Bosch stated that his country “is not pro-American, it is United States property”. Santo Domingo is, in effect, a kind of point-proving addendum to his Cops of The World. Yet it is not presented as a list of dry-facts in song. It is a song rife with drama and tension. There is sadness and violence, but it is measured, precise. There is a clarity to the language that still allows for moments of poetry. At its heart however this is perhaps Phil’s finest moment of song as motion picture. The lyrics act as a camera sweep, picking out detail amidst the carnage. Beginning with images of scuttling crabs, burning sand, scattering fish and the churning sea, which act as a kind of pathetic fallacy. So much of what is really going on here is implied. Far from the bluntness of his earlier songs, there is subtlety here. Coming as it does so soon after Cops of The World adds meaning to it certainly, but the implied threat is nevertheless powerful, if subtly delivered. Simple images of quiet locals – sweating fishermen, boys throwing pebbles on the shore – contrast with the warships and their accompanying “thunder”. These contrasts are everywhere – farmers yawning in the “grey silver dawn” (such a typically Ochs image) alongside the boldness of the soldiers, in their “cloud dust whirl” – singing merrily, whistling at the girls. The seagull’s “cold cannon nest” hints at an uneasy peace as well as the threat of violence to come. “The old women sigh, think of memories gone by, they shrug their shoulders”. For all the drama unfolding, with a little bit of a wider perspective, this is just history repeating. This is a key lyric, and something that Phil was particularly fond of (“we’ve done this before, so why all the shock”). For all the jibes of his topical songs becoming quickly dated, one of the key messages that Phil’s songs impart is that so little ever changes. Think of I Ain’t Marching Anymore with its historical sweep, or his history-lesson-as-protest-song We Seek No Wider War. It’s little wonder then that Phil’s “topical” songs remain so pertinent now. Other images stand out. The single sniper in a gunfight, hopelessly outnumbered seems heavily loaded with symbolism; the puny revolutionary forces being crushed by the imperialistic might of the United States. “the soldiers make a bid, giving candy to the kids, their teeth are gleaming”? Again it’s such a rich lyric, alive with meaning. One the one hand it implies the meagreness of what the soldiers (and by extention) the US occupancy is offering. They’ve just shot someone dead, and all they can offer is sweets. That final line part though, “their teeth are gleaming” is all about contrast. Contrast between the healthy young soldiers and the scatty kids. Contrast between the mess that the soldiers are making on foreign soil, leaving their homeland clean and safe. It’s a wonderful lyric. And a final moment for the history books. “The traitors will pretend that it’s getting near the end when it’s beginning”. The impact of the events of April 1965 are still being felt today. The same mind-set that sent US marines to Santo Domingo has sent US troops to Iraq and Afghanistan. The same issues that led to a “failed” revolution in 1965 are still prevalent today. Some have argued that the time has come for new revolution across poverty stricken Latin America. Phil’s song acts, as so many of his do, as a warning from history – try to step out of the United States’ shadow and you’ll find yourself in a whole heap of trouble. I was once asked to sing some of Phil’s songs at a Peace Festival in Liverpool organised by CND. I immediately said “no”, then thought about it and eventually said “yes”, unable to resist the opportunity to sing Phil’s songs to an unsuspecting public, no matter how nerve-wracking it may have been. I felt this surge, this rush of blood to the head. I can almost feel it now, that same feeling, somewhere between anger and excitement; anger that these words can still ring so true, excitement that Phil was able to capture so purely something that would blast down the decades. Cops Of The World was written at a time of escalating American involvement in Vietnam, from 16,000 troops in 1963 to over 180,000 in 1965. This isn’t just about Vietnam however. Writing at a time when the so-called Islamic State are goading the west with their particular brand of unimaginable horror it is important to consider the wider role that American military intervention has played in destabilising the peace of the world. It’s about Korea. China. Cuba. Guatemala. Indonesia. Congo. Peru. Later Phil could have written about Laos. Cambodia. Grenada. Libya. El Salvador. Nicaragua. Panama. Iraq. Sudan. Afghanistan. The difficulty is that anti-American feeling (however justified some of it may be) has created an impression of American monstrousness that makes this a topic difficult to discuss with any kind of a clear head. The joy of Phil and his brand of unsentimental songwriting allows the listener (in my case, the uneducated listener) the opportunity to step back from the bigger picture with all the pitfalls of various biases and consider things from Phil’s perspective. In dispensing with the daftness of Draft Dodger Rag nor utilising the pin point song-as-movieness of Santo Domingo, nor going for the almost abstract madness of White Boots Marching In A Yellow Land (which though released later, dates from around 1965) – Cops Of The World retains elements of all these songs. The overall feeling, besides the obvious anger, is perhaps disappointment. Key to an understanding of Phil’s approach to the topic of American military intervention is that, at this time at least, Phil was still something of a patriot. And this is the problem! Phil wanted to believe that there was inherent good in America, that the good he felt he could do – through his songs and his activism – was inspired as much by his nationality as his politics. His good was an American good. And yet there was an ever growing list of evidence to suggest otherwise – both at home and abroad. Images of patriotism and American culture litter Cops Of The World, “our Coca Cola is fine, boys”, “have a stick of our gum” (a line echoed in Santo Domingo “the soldiers make a bid giving candy to the kids”), “if you like you can use your flag”, “we own half the world, oh say can you see” – distorted images of distorted motives. For that is the key to an understanding of this very American brand of militarism – the awkwardness of knowing that while there is good there, deep down, well-hidden – the real motives for these actions are not moral but ideological and economic. This isn’t so much empire-building, as market-building – “the name for our profits is democracy”. “And we’ll gladly pay for all we destroy”. A nation obsessed with money, obsessed with its power. Money as kingmaker and serf destroyer. Money bestows the ability with such totality, that motive and conscience follow tremulously in its wake. Remember though that the refrain, repeated not once but twice at the end of each verse is “We’re the cops of the world, boys”*. “We’re”. This isn’t that modern sport of America-bashing from without. This is America-bashing from within; an American singer singing to an American audience. The key here is complicity. Cops Of The World is Phil’s ode to refusal. It would take a couple more years to Dr King to acknowledge it, but the links between the civil rights and peace movements were becoming undeniable. In What Are You Fighting For? Phil sang “if we win the wars at home there’ll be no fighting anymore” – a line that I have always found slightly uncomfortable, but the inference is clear – that internal injustices were being echoed externally. As with the images of patriotism, this song is also filled with images of bigotry, be it anti-Communist (“dump the reds in a pile, boys”), misogynist (“just take off your clothes and lie down on your back”) or racist (“we don’t care if you’re yellow or black”). Beautiful. A little late perhaps, but beautiful all the same. So the next time someone uses its various military incursions to denounce the good name of the United States of America remind them of Dr King, of all those Americans who fought for peace and continue to fight for peace. And remind them of Phil Ochs – American. *An end note about an odd note. At the end of each verse Phil plays a mischord. A moment of inspired disharmony. I’m assuming this is on purpose! It’s uncomfortable, a little moment of the kind of experimental excesses we’ll later hear on Half A Century High and The Crucifixion. I suppose I’d better admit it straight away. I don’t like this song. I have absolutely no interest in it. Oh, it’s nice enough I suppose, but that is part of the problem. It is worth bearing in mind that quite apart from being a performer and recording artist in his own right Phil also worked very hard to get his songs recorded by other singers. If There But For Fortune sounds like someone else’s song, which it does to me, then the reason might that to a large extent it is someone else’s song. Phil’s quip that it was written for him by Joan Baez actually has a ring of truth to it. Part of Phil’s problem, albeit a problem that to large extent he created for himself, was that at the heart of his aim to become the “first left-wing star” was a dichotomy that he struggled to fully come to terms with. In being “left-wing” he was compelled to challenge issues head-on that would be considered controversial by a mainstream audience. In wanting to be a “star” he would have to find a way of dealing with these issues in such a way as to be palatable to a wider public. The compromise solution was There But For Fortune. In Phil’s introduction to Love Me I’m A Liberal he calls out liberalism as being chiefly concerned with issues only they affect them personally. There But For Fortune is an extension of that, a gentle reminder that these issues that may seem remote (war, homelessness, alcoholism, criminality) could very easily bite you on the arse someday. It is a protest song much in the way that Blowin’ In The Wind Is. That is to say that it isn’t a protest song at all, but rather a song that suggests a concern for issues that it utterly fails to deal with in any meaningful way at all. Where it fails as a protest song (or arguably as a Phil Ochs song) it succeeds as a pop song – though it may suggest social concern, it is vague enough to pass as innocuous. The song’s greatest crime however may be in utilising a cliché at its very heart. The refrain “there but for fortune may go you and I” is just an atheistic take on “there but for the grace of God go I”, its meaning unaltered, its uselessness as a concept unchanged. Clichés turn up in a few other Phil songs too – think of “when in Rome do as the Romans do”, “the bigger they are, the harder they fall” – but he’s at his best when subverting them – “Cross my heart and I hope to live” is a personal favourite. Even worse is that coupled with this cliché is a contradiction – the chorus goes from “and I’ll show you a young land/ man with so many reasons why” (suggesting that behind the troubles of a person or nation are genuine reasons) to the suggestion at the heart of these problems are misfortune. If there is one thing that Phil Ochs songs teach us it is not fortune that creates bad situations, it is the actions, or inactions, of men (always men!). What this is I suppose it is a song about empathy. Social concern. Caring. The understanding that bad stuff can happen to you and me and anyone in the right set of circumstances. In other words – stating the blooming obvious. There is very little joy in tearing to pieces a song that I know means a lot to people. There is even less joy however in pretending to appreciate a song that I feel nothing for personally. Trying to prove a point via statistics is always oh-so tempting, but is nevertheless fraught with danger. Finding the perfect stat is the first problem. Failing to do so can lead to just picking anything that might support your argument, regardless of its source of validity. 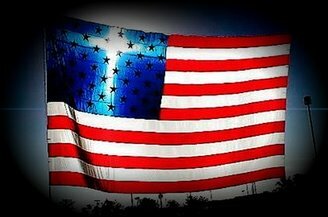 I found some statistics via Wikipedia that stated that the amount of Christians in the United States had dropped from 89% in 1965 (when Phil wrote Cannons of Christianity) to 70% in 2014. This was what I was thinking – every word of Cannons of Christianity still holds up, it still retains it’s relevance. Possibly as much as any of Phil’s songs from the same period do. However, it is the omnipotence of Christianity that has changed. From being the only thing in town it is now mired in its own controversies, schismed to the point of irrelevance. The rise of Islam and Atheism, the liberalisation of societal morals, has made poor of Christ and his followers seem backwards and anachronistic. That was the argument anyway. Trouble is, I don’t really believe it. Christianity is still here and remains every bit a cornerstone of the American experience. Cannons, though presented purely as an attack on Christianity, also touches on other subjects close to Phil’s heart – fear of authority, financial inequality, globalisation, empire building, hypocrisy, corruption and war (indeed the role of the church during wartime is something Phil would return to later in his Chaplain of The War – “But the church is known to change, embracing half the wrongs it hopes to right”) The notion of the modern church as hypocritical is one that intrigues me. The idea that the church and its practitioners doesn’t practise what it preaches is a strong one, but the suggestion remains that much of what it preaches is good and worthy. In a sense this could be a sister song to Love Me I’m A Liberal or Links On The Chain where the anger derives not so much from opposition to the doctrines in question (Trade Unionism, liberalism, Christianity) but from a lack of adherence to their own teachings and preachings. Think of Phil’s attitude to his own patriotism. When he turns on his nation it is not because he hates it, but because he is disappointed with it’s inability to live up to its own potential. To me it’s an interesting notion, and may begin to tell us something of how Phil viewed himself and his own work. There is an argument that he set himself impossibly high standards, standards that he had no hope of living up to. Maybe the standards he expected of others were similarly out of reach. Think of those he sang about in his previous LPs – Kennedy, Ruben Jaramillo, Christ – all dead, and in death, all the more powerful, incorruptible and saintly. One of Phil’s jokey intros to Joe Hill says much about this process – Joe, he said, was a minor left wing hero, till he died and became a major left wing hero. Where Christ does appear in Phil’s songs it’s usually as a symbol of man’s failure and corruptibility. Think of the desperate richos in The Ringing of Revolution, kneeling by the cross where “the blood of the Christ is still flowing” or the image of the “fallen face of Jesus” in Here’s To The State Of Mississippi, where the “cross once made of silver now is caked with rust”. Fantastically strong, emotive symbolism. That’s part of the problem though. As this strong symbol Christ is impossible to live up to, partly because he is not a real man. This is a point I keep coming back to with Phil’s songs. He had such high standards. Such high expectations. Which isn’t to say that he wasn’t justified in writing Cannons. Feeling personally slighted by other’s religious beliefs is one thing. People’s religious beliefs actively influencing a nations politics is quite another. And that is one thing where little has changed. Marriage equality, women’s rights, education, all suffering, all being strangled by bigotry. Christianity as an excuse for small mindedness, as an excuse for bigotry, as an excuse for stemming the flow of social justice is inexcusable. Using Christ as a tool for the worst kind of reactionary conservatism is just horrible. Jesus deserves better. There’s a word I keep going back to when thinking about so many of the songs on Phil Ochs In Concert, and it’s a word that seems especially appropriate here. That word is “disarming”. Excuse the pun but, central to Phil’s arsenal was his power to disarm an audience, to lull them with his boyish charm and them, BLAM, hit em where it hurts. Phil’s spoken intro to Cannons of Christianity is a case in point (“Ochs, wake up, this is God here. Over.”) – it is disarmingly cute. The song itself is disarmingly gentle (it is the world’s first “anti-hymn” after all). The lyrics, of course, are anything but gentle. And therein lies Phil’s great skill. To hector without seeming to be hectoring, to preach without preaching, to fingerpoint so gently that it’s almost a tickle. To deal with such issues as Phil does and maintain a certain dignity is one of Phil’s great strengths. Together with Lindsay Mercer (who contributed the piece on Days Of Decision to this site) I have started up a little website that, we hope, will gather together just a little bit of the various creative works that have been inspired by Phil Ochs. So if you are, of know of, a Phil Ochs inspired painter, singer, poet, potter, dancer…anything! Please get in touch! It’s early days yet but I hope that it turns into something rather nice. As is often the case, this song isn’t quite as straight-forward as it seems. Sure, it is certainly one of Phil’s more unapologetically finger-pointing songs, but the way in which he approaches it makes it transcend the simplicity that such a such a song would suggest. It is effectively a follow-up to I Ain’t Marching Anymore. In that instance Phil drew up a whole load of historical reasons for not enlisting. Here he challenges those who would enlist (and by extension those who support the very idea of sending young men off to fight) to question their own motives for doing so. He does this via a series of questions that, though they veer towards the rhetorical, remain unanswered. That these are followed by a full-on sarcastic refrain create a slight unease. Indeed one could be forgiven for thinking that by the end of the first verse that this was a pro-war song, where it not of course for the fact that it was being sung by Phil Ochs! The gentleness of that first verse, with its references to glory, loyalty and duty serves to lull the unsuspecting listener into a false sense of security. The refrain – “Pin a medal on the man” – seems rather benign. Then again, this is Phil Ochs. Surely we all know what is coming. The second verse begins to ramp up the pressure. An early reference to wrapping a flag around an early grave suggests that this isn’t the song the first verse might have suggested. This image – one that also appears in Phil’s Song of A Soldier (“the flag draped coffins are sailing home”) – is obviously a strong one. So often an image of courage and patriotism here it is presented as something approaching the pathetic. Indeed images of flag draped coffins arriving home from the most recent American interference in Iraq were actually banned by some US broadcasters. The unease which Phil conjures here from such an image has obviously carried forward into the present day. Such an image is a reminder of course of the consequences of military action, something that someone hoping to further the cause of military enlisting would seek to avoid. The appearance of such an image so early in to the second verse makes clear what whatever this song is about it is not about furthering the cause of the US military. The following lines – “a soldier to the world, a hero to his heart” – therefore, appear little short of sarcastic goading. Once we get into the third verse, as the melody gets playful, Phil really goes to town. “Is there anybody here proud of the parade” harks back to Track One Side One of his debut LP, another sarcastic take on American militarism. One of the things I like most about Phil’s songs is that though his songwriting very obviously changed certain ideas echo through them. The line “So do your duty boys and join with pride” from The War Is Over may not have worked in the context of this song, but isn’t such a big step away either. Similarly One More Parade is again evoked in the line “is there anybody here who thinks that following the orders takes away the blame”. In One More Parade it is “all march together everybody looks the same, so there is no one you can blame”, but the inference is the same; blame can only be apportioned if something bad has occurred. Again this inference of badness is only suggested, but as Phil keeps the questioning coming, from a drip into a torrent, the suggestibility of these lyrics becomes stronger and stronger until Phil asks “is there anybody here who wouldn’t mind murder by another name” and there it is, the killer line (pardon the pun). And finally we are left in no doubt. When “Pin a medal on the man” appears again Phil’s work here is done. Even sarcasm doesn’t do justice to how that line appears now. Its meaning has changed almost totally from its appearance in the first verse. Phil’s “quicksand of questions” have done their job and without saying anything, without committing to anything so mundane as a statement, Phil’s point is made. It’s heady stuff. It’s perhaps worth bearing in mind that song was being sung at a time when there were many, many people wanting to do their part, or rather being forced to. When Phil wrote One More Parade there were something like 12,000 American troops in Vietnam. By the time he was asking Is There Anybody Here? there were somewhere in the region of 380,000. When he sang The War Is Over – with no little pathos – the numbers had increased beyond 500,000. So, to answer Phil’s question – yes. I’m afraid there are. I’ve been umming and ahhing over writing about this song for far too long now. So I’m just gonna write the damn thing. The trouble is that I honestly feel that to some extent with this song Phil reached some kind of perfection. The mixing of his own songcraft with the kind of confident politicking that would inevitably be all too fleeting. There is a wonderful certainty about this song both in content and style. And while his song writing (and song crafting) would continue to evolve and strengthen, the certainty of his political convictions would do anything but. The title itself is something a giveaway – The Ringing of Revolution – the word “ringing” is crucial. It suggests clarity. Phil would later change it to The Rhythm of Revolution, apparently because it sounded better, but perhaps also because he had already lost some of that clarity. Rhythm suggests the slow building of pressure, ringing suggests a certainty and urgency. This the kind of song that only Phil Ochs could write. This is the kind of song that only Phil Ochs did write. Read cold on the page the lyrics seem harsh and stark and somewhat brutal – that killer line at the end that “only the dead are forgiven” kind of sums it up. Yet there is something disarmingly sweet about the delivery, something almost lullabyish. For all the brutality and violence of the lyrics, it is steeped in fantasy. Not the wild flights of fancy of The Doll House maybe, but certainly a key stepping stone towards When In Rome, a song with which it shares so much. This is revolution as fairy tale. Songwriting as wish fulfilment. Phil as Hollywood director. Something else that disarms the listener is Phil’s spoken word introduction, filled as it is with humour and no little self-deprecation. It’s a funny thing (in both senses of the word) to introduce what appears to be such a brutally serious song with such a daft introduction. It brings to mind an idea that would later be used with far less subtlety on Outside of a Small Circle of Friends; this idea of content and style working against each other. In the latter case the style of the song (a jaunty jazziness) allows Phil to almost smuggle in some pretty cutting lyrics. The same isn’t quite so true here, but it certainly allows Phil to grab the listener’s attention and once he gets it he makes damn sure they can soak in every word. And that’s the point. Phil’s delivery belies the caustic lyrics by being careful, showing up the lack of restraint in the lyrics by showing the upmost restraint in his performance. It’s a wonderful thing to behold. Hollywood is perhaps a key reference point, one accentuated by, and not solely attributable to, his spoken word introduction. Phil’s lyrics are not so much poetic as cinematographic. They sweep and swoop like a camera on a crane. Phil flits from looking in at the “merchants on style” and the “soft middle class” to zooming in and listening in to their desperate conversation. By the third verse we are inside their minds, reading their thoughts. And here comes the first key line, as the separateness of those attacking and those being attacked is described as the “distance only money could measure”. From here on in we are left in no doubt – what is being enacted is a Socialist revolution. The moneyed getting their comeuppance. A key difference between the lyrical camera of Phil Ochs and the real cameras of Hollywood is a distinct lack of sentiment. There is no backstory, no seeking of understanding, certainly no empathy. More to the point, this is a film that would never be made. 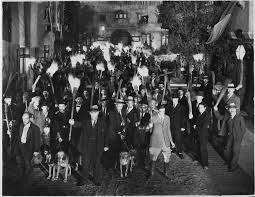 The villagers with the pitchfork are Hollywood enough, but the Frankenstein’s monster they are hell bent on destroying most certainly isn’t, for this monster is Capitalism. Phil casts these monstrous Capitalists with the spirit of Charles Laughton (he of Hunchback of Notre Dame fame), a less attractive film star you’d be hard pressed to find. They are undoubtedly the villain of the piece. They don’t even begin to question their own innocence, all they do is plead for mercy. At their last they try to cling on to their final vestiges of wealth (“with pillows of silk they’re embracing”) and end up being mocked for the very thing that has created this desperate situation. Their desperation being met not with violence (not straight away anyway) but with the laughter of the crowd. It’s a mean scene for sure. There is a key moment in Phil’s introduction where he describes those being attacked as being the “last of the idle rich…the last of the folk singers”. It’s a throwaway, daft remark. Or least it is delivered as such. Yet there is something else there. Phil isn’t willing to create a simple us and them scenario, where the audience is on his side and they, together, attack this other. Ringing of Revolution is followed by Is There Anybody Here? and Love Me I’m A Liberal, two songs that are hell bent on confrontation. I didn’t use the Frankenstein reference glibly (well, I did at first, but thinking about it is rather apt). The point being that if this is a song attacking Capitalism (which it is) then this “last of the folk singers” line is a little reminder of the culpability of all those present, Phil included. Far from being the antidote to pop music’s excesses, folk music by 1966 had become almost totally inseparable from it. In striving for popularity folk singers had become part of the very thing that so many of them had proclaimed to be opposed. The nadir was perhaps reached in 1965 with the release of Barry McGuire’s Eve of Destruction, a pop song masquerading as a folk song*. Phil may have attacked the song due it a lack of quality rather than anything to do with its authenticity, but one could argue that the two things are inexorably linked. So drink it in. For all Phil’s complaints about Barry McGuire his best response was a song such as this this – fun, sincere and deadly serious. Only Phil Ochs could pull off a song like this. And here it is in all its unapologetic glory. *I feel the need to add that I really like Eve of Destruction. It’s a bit silly as well as being terribly insincere, but I can’t help but enjoy it all the same.